How gorgeous is the stunning Cocktail Necklace pictured above? After it came in the mail I wanted to wear it with everything, and luckily it goes with everything – you don’t need to wait for a cocktail evening for this! It looks stunning over the collar of a button-up shirt or a plain t-shirt. I kept this necklace the statement piece in my look, pairing it with a simple wash of colour over the eyelids. Cream eyeshadows are my favourite at the moment – they’re simple to apply and you don’t even need any tools. I used a clean ring finger to apply this purply-taupe shade across my eyelids and brought it under the eye, too. I don’t get strict about which colours belong to which seasons, but as we’re heading out of the cold months I thought it would be nice to bring out some berry shades on my cheeks and lips before I start itching for brights. This blush and lipstick coordinate perfectly and I think they make the eyeshadow look a little more purple, too. 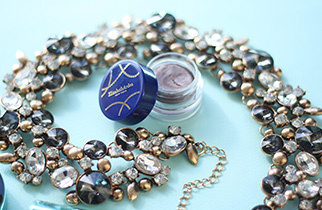 That hint of sheen on the eyelids is the little detail that really ties this look in with the necklace. You could amp this look up for night by bringing in some more colours of eyeshadow, darkening up the crease and lashline a little.